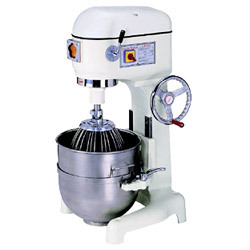 Our vertical agitator, the work machine designed for professional bakers, the metal table can be loaded mass quantity you need with construction firm designed and secure electronic switch, all the function of agitation can work smoothly in different speed; the transmitting motor strengthened, gear parts with low noise, and multi-function accessory reach the requirement of the patent. Therefore, leader is the best choice and the assistant for your profit. 1. Capacity: 12kg/ 50liter. 2. Size: 67 x 57 x 108. 3. Weight: 250 kg. 4. Packing: 76 x 69 x 125. 5. G.weight: 320 kg. 6. Motor: 2 hp. 7. Watt: 1.5 kw. 8. Agitator / planetary speed: 37/120, 82/269, 144/473.r.p.m.